Cobalt is both a cosmically huge side-scrolling singleplayer adventure and an intensely competitive multiplayer arena. It’s awesome. Oxeye Game Studio made it, we published it and the PC version is free for to you to play until Monday 18th April! Download it right now and enjoy the thrill of blasting robots with super slo-mo trick-shots, uncover the secrets of a distant colony, pit your skills against co-op challenges or ruin your friends to rule the leaderboards! If you like what you see, you can buy the game at 33%-off the usual price. 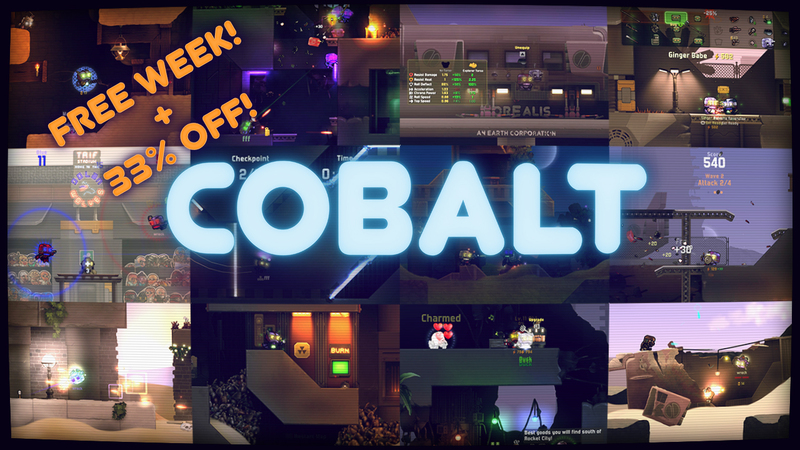 That offer lasts until Monday too, so you have the weekend to explore Cobalt’s crazy-cool robot-sploding antics before you decide to open your wallet. You can get Cobalt for PC on Steam, and for Xbox 360 and Xbox One. The price isn’t discounted on Xbox, but it’s still the finest game about slow-mo-somersaulting, gun-toting robots to be found anywhere in the known universe. We would say that of course - so don’t take our word for it, just read the glowing user reviews!